The Indians will open their 2019 Spring Training against the Cincinnati Reds on Feb. 23. Baseball season is around the corner. 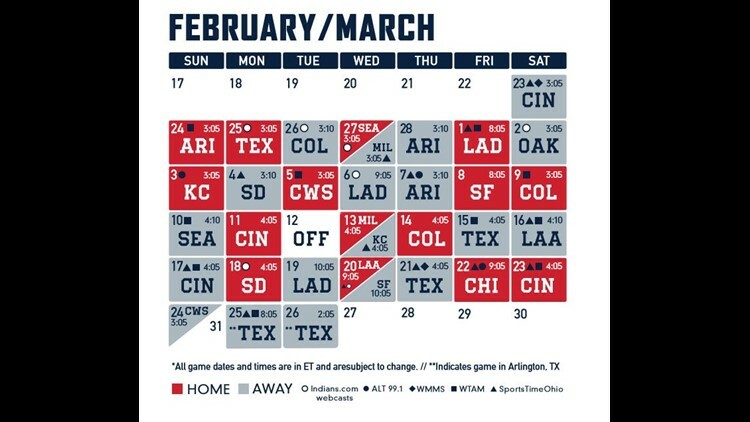 On Wednesday, the Cleveland Indians announced the broadcasting schedule for their 2019 Spring Training slate, which will include 12 games televised on SportsTime Ohio and 15 games on the Indians Radio Network, including local broadcasts on WTAM, WMMS and ALT 99.1. Seven more games will also air via webcast on Indians.com. The Indians will kickoff Spring Training with a televised game against the Cincinnati Reds on Feb. 23. You can find their full Spring Training broadcast schedule below. Pitchers and catchers are scheduled to report to Spring Training on Feb. 12, with full squads arriving on Feb. 16. This preseason will mark the 10-year anniversary of the Indians moving their preseason to Goodyear, Ariz., with special giveaways and events planned to celebrate the occasion.